Ever wondered about the cost of unions and organizations that are in conflict? Ever wondered why they don’t start out looking for solutions? Think of the negative ROI – the waste of time, money, motivation, innovation and productivity. At its worst – the recent demise of the Hostess company and the Twinkies brand! An organization and its union may be skirmishing, infighting, or in open conflict. It’s a battle for power and the competition between the two sides is inefficient, sometimes deadly. Both sides think they are ‘doing their job,’ but they’re not thinking about outcomes for the organization, the workers…and the customer. It’s about who’s right and one side usually bullies the other to force things through. Now think about the cost to the likes of Hostess and the Twinkies brand … and the workers in that organization. Both sides see each other as the problem. Problem-focus is normal in organizations, but much worse when the groups in conflict compound it. They may think they have a solution at hand, but instead they are each vested in being experts on the ‘problem’ with the other side. Speed up solution-building by framing meetings around what’s possible and what’s wanted, not the problem! So, how do we get them out of problem-focus and move to solution-building around common goals? How do we move from negotiation to co-creation? Don’t experiment on problem monkeys. Experiment on solutions. We have to ignore the problem between both parties. What are you both doing right? What would your shareholders, leadership, workers and customers tell us you are doing right? What would the other team say you do right? What are each of your key deliverables / goals? And, on a scale of 1-10 (1=room for improvement, 10=ideal), where are you? Suppose the barriers to success went away, what would that success look like (to you, to the other side, to the customer)? What would be different / better about the way you work together? Where will you have both made the greatest progress? What will you see yourself doing to help make progress towards your shared goals? Note that there’s little discussion about the contract that organizations and unions usually focus on. Instead they are focusing on co-creating outcomes that will make progress for both sides. Will this approach work 100% over-night? Unlikely, but it will help make progress right away. Where have you seen examples of organizations and unions making progress? another thought provoking article. I really heard alarm bells when I read the part about “It’s about who’s right and one side usually bullies the other to force things through”. From my background of managing complex IT and Telco projects worldwide, I compare this notion of “being right” to a slow-acting poison in the majority of project management steering meetings. Just like the management/union example you use, I see too much project management time being spent on lobbying rather than cooperating with stakeholders. Where there is too much problem talk, then project manager time is reduced to analyzing the risks from known problems (i.e. covering up and justifying past mistakes) rather than gathering evidence of working solutions (i.e. building a foundation of team confidence for the future). 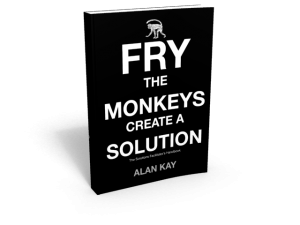 I have used many tips and prompts from your “Fry the Monkeys” book in the last couple of projects I worked on. As a result the conversations we had helped the project teams shift their focus away from analysis and risk focus to more courage and creativity. By asking ourselves different kinds of questions, confidence builds and people are more willing to experiment and much more resistant to setbacks. The biggest kick was that we had more fun at work. We even posted monkey pictures and cliparts in our project notes to remind us when we were getting too fixated on the problems and when we felt the team energy levels going down. Of course we still tracked our project risks and deep-dived problems where necessary, but we more or less eliminated the gridlock and finger-pointing in project reviews. Going to contact you to learn more about the “Better Meetings” work – looks great !